…writes commentary for the Observer. He was born in 1953 and has published four novels with Orion, Remembrance Day, A Spy’s Life, Empire State and Brandenburg. The last won the Ian Fleming Crime Writers’ Association Steel Dagger as the best thriller of 2005. It is set in the eight weeks before the fall of the Berlin wall in 1989, and was published in paperback in February 2006. He has also written one non-fiction title, Lies Damned Lies, a study of truthfulness in British journalism. He continues his epic throwdown by first providing a good example of evidence as proof: the reality of the Cretaceous-Paleogene extinction event (that big asteroid, remember?). …you would maybe start by citing the worldwide layer of sediment known as K-Pg boundary…the soot that is associated with this layer, the site of a huge impact in the Yucatán region of Mexico 66m years ago and, finally, you’d ask what else could have caused the dinosaurs to die out more or less overnight. So you would quote more evidence, such as the presence in the K-Pg layer of iridium…the long darkness when only ferns grew and the fact that the seas were emptied of all but the most tenacious species. Ah, but this is still all very hypothetical, the sceptic would say, at which point you might give up and tell him, yes, a spacecraft might have visited Earth and exterminated 75% of the world’s species, but you’re going with the best available evidence. The sceptic would walk away, satisfied that he had achieved a draw, not from the merit of his argument, but simply because he had not let you convince him. They are always the sniping antagonists, rarely, if ever, standing up to say: we believe in the following facts and here is our research. It is a risk-free strategy – at least for the moment – that comes almost exclusively from the political right and is, as often as not, incentivised by simple capitalist gain. I tell you, this essay is a thing of beauty. So Porter wants the denialists to organize their own international “scientific” conference where the evidence in favor of their increasingly irrational beliefs is finally set out for all to scrutinize. Of course, that’s already happened. Several times. 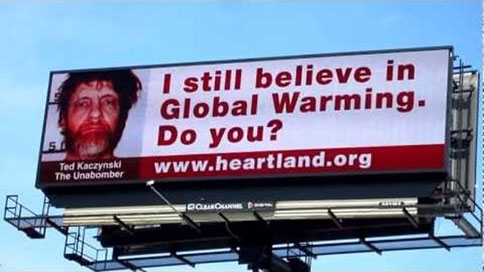 That would be the Heartland Institute, creator of the infamous Unabomber Billboard. The event, called the International Conference on Climate Change, was started in 2008 as a way to organize libertarians — many of whom believe that taking action on climate change would create a one-world government dominated by the United Nations. “There’s not a lot of science here,” said Scott Denning, an atmospheric scientist from Colorado State University who attended the event last year to present the so-called “warmist” case. Neither Denning nor any of the other 97% of climate scientists who say human activity is warming the planet presented at this year’s conference. I mentioned that most deniers come from the right and it is true the uninterrupted business of capitalism, which often entails waste of resources and energy, is a priority, but there is something deeper that explains why there are so few deniers from the left and that is to do with conservative mind. In his 1956 essay “On Being Conservative”, the philosopher Michael Oakeshott wrote that the man of conservative temperament is “not in love with what is dangerous and difficult; he is unadventurous; he has no impulse to sail uncharted seas. What others plausibly identify as timidity, he recognises in himself as rational prudence. He eyes the situation in terms of its propensity to disrupt the familiarity of the features of his world”.